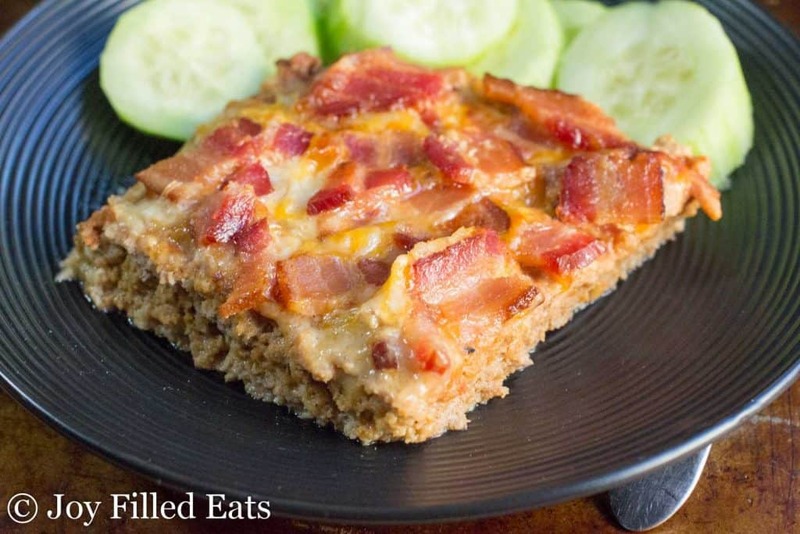 This BBQ Cheddar Bacon Meatloaf comes together in about 5 minutes. It has so much flavor from the barbecue sauce, bacon, and cheddar you won’t be able to resist having seconds. I have made this meatloaf for years. It is actually on my blog already with a few tweaks in the form of mini meatloaves but making one big one is always easier. The combination of barbecue sauce, bacon, and cheddar cheese goes well on just about anything. P.S. We actually had roasted broccoli on the side but it wasn’t ready yet for the pictures. Need to finish up photos before my family eats it all! I recommend serving this with a green vegetable or a nice crisp salad. 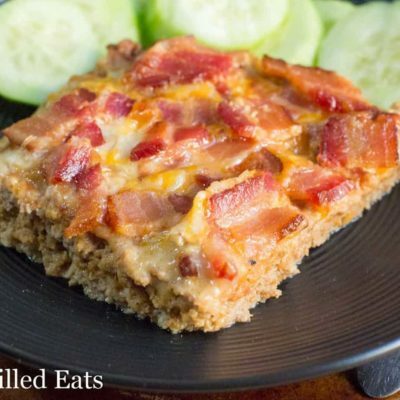 Whenever my kids ask what we are having for dinner and I say meatloaf they reply with “the one with bacon and barbecue sauce?” And more often than not this is the one. It is just as good the next day and they’ve been known to take leftovers to school in a thermos. And make sure to check out my video demonstrating how easy this family-friendly meal really is! 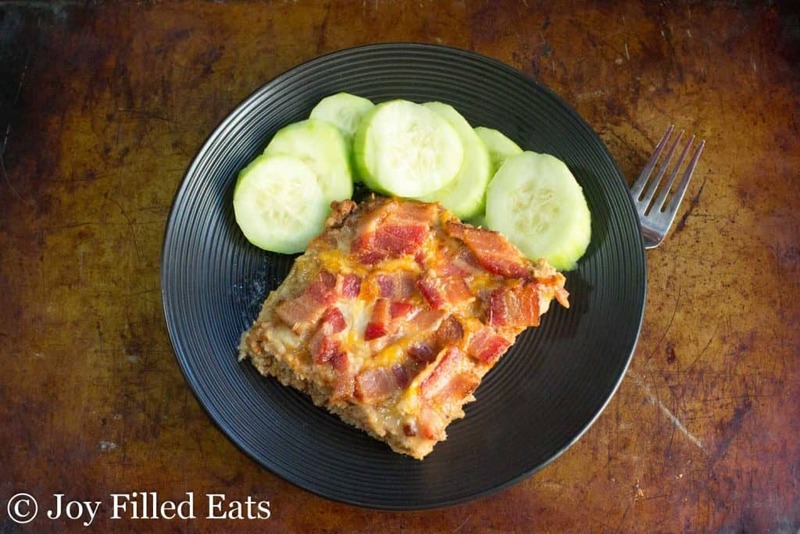 This BBQ Cheddar Bacon Meatloaf comes together in about 5 minutes. 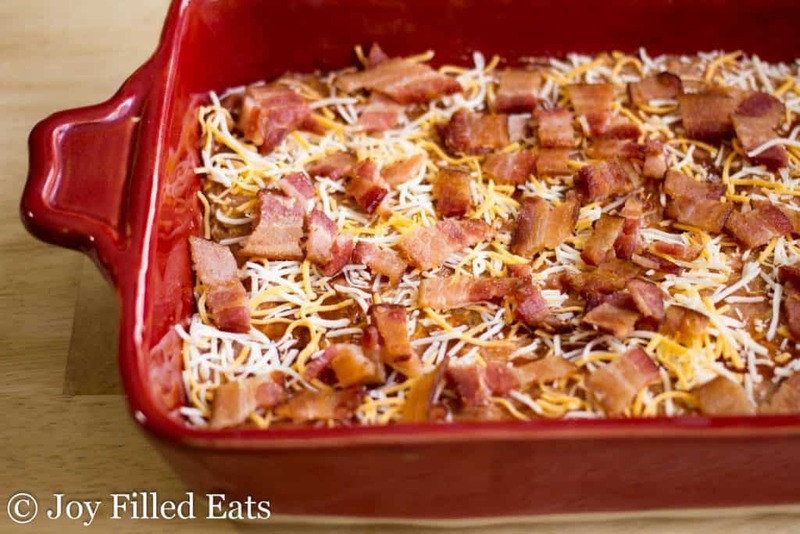 It has so much flavor from the barbecue sauce, bacon, and cheddar you won't be able to resist having seconds. Combine all the ingredients for the meat and press into the bottom of a greased 9 x 13 casserole dish. Brush the barbecue sauce on top and sprinkle on the cheese and bacon. Bake for 30-40 minutes or until 160 on a meat thermometer. This was a hit for the whole family of 6. After 35 mins I turned the broiler on high and let the bacon crisp up for about 4 minutes. Had to watch it very closely but the result was worth it. 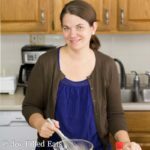 Fantastic family friendly comfort food that satisfies the adults on keto and the kids who are not. Thanks!! THIS LOOKS SO GOOD & I CAN NOT WAIT TO MAKE THIS. Can this be made in a traditional meatloaf pan? Yes, you will need to increase the baking time. I have not tested it so I'm not sure how much longer it will take. I put this recipe into MyFitnessPal and I realize it's a free app so it's going to have mistakes, but it says there are 32 carbs PER SERVING! Any suggestions? I loved this, as did my husband, and I would love to make it a couple times a month but the carb count is really confusing me. MFP is using a sugary bbq sauce. You need to use a sugar free one. As the meat cooks and releases juices, it does shrink. 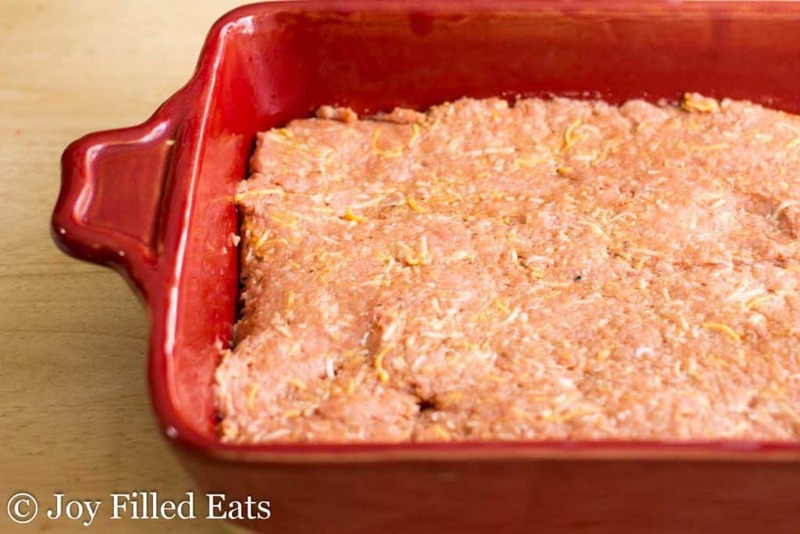 This happens with most types and cuts of meat but can be more noticeable in a meatloaf. What brand of BBQ sauce do you use? I'm having trouble finding one with low carbs/sugar. Thanks! I make my own when I can. There are a lot of recipes for sugar-free barbecue sauce online. Otherwise, Walmart does sell one that is sweetened with sucralose. I made this last night. So easy, and so tasty. 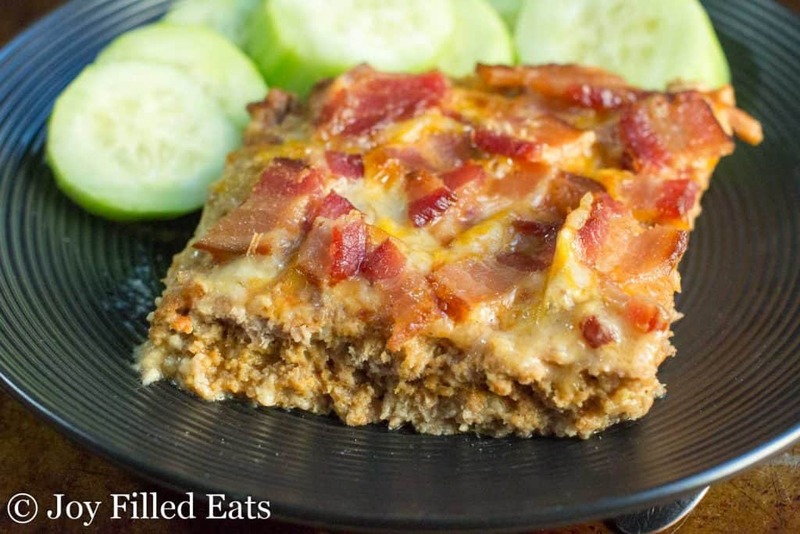 I love meatloaf, and I am glad to have a recipe for a low carb version.